If you have been using and/or teaching music students the CIRCLE of FIFTHS, that’s OK!! However, if you REALLY want to advance as a composer, arranger, pianist, organist, I suggest that you change direction immediately and take a look at all the great advantages of the “Musical Clock” aka. Circle of Fourths! Learn Key Signatures: Key of C has NO sharps or flats. Note: We add one flat at a time NEVER taking them away! Bb is at 2 O’Clock. 2 Flats Bb and Eb (We add in order of the Fourths. Eb is at 3 O’Clock – 3 flats: Bb, Eb, Ab. 6 flats: Bb Eb Ab Db Gb Cb (B). SHARP KEYS: Just like Bb is the “Starting Key” for the flats, F# (the note F is next to Bb, “very interesting”!) is the Starting key for the sharp keys. They are friends! Key of F# 6 sharps: F# C# G# D# A# E#. This is so much easier than the old way to learn the keys! (Find the added sharp and go up ½ step, or in the flats, go up a fifth from the last flat added! Forget that!! BASIC to ADVANCED Chord Progressions. All songs from popular, hymns, to classical compositions are supported by chord (Harmonic) changes or progressions. When you are supporting a melody (or musical phrase) with the same harmony (Chord) you are not necessarily creating a chord change, rather just harmonic repetition. For Ex. Play a song like “Twinkle, Twinkle, Little Star” in the Key of C. Support the melody with only a C chord (C-E-G) in the left hand. Your ear will tell you that by the THIRD measure, the chord needs to change! When you STEP BACK one letter on the CLOCK to G, you are NOW starting the progressive ACTION!! Once you change the chord to G, the Circle of Fourths progression steps into motion! This is because the 3rd tone (B) in the G chord is the leading tone in the C scale. Simple songs generally start with the tonic chord (key of origin) and change to the dominant (one back on the clock) however, when you want to move forward with more advanced changes, (in an orderly basis of learning) you simply add the next key back. (Starting with C, jump back to D, then move to G and onward to C). 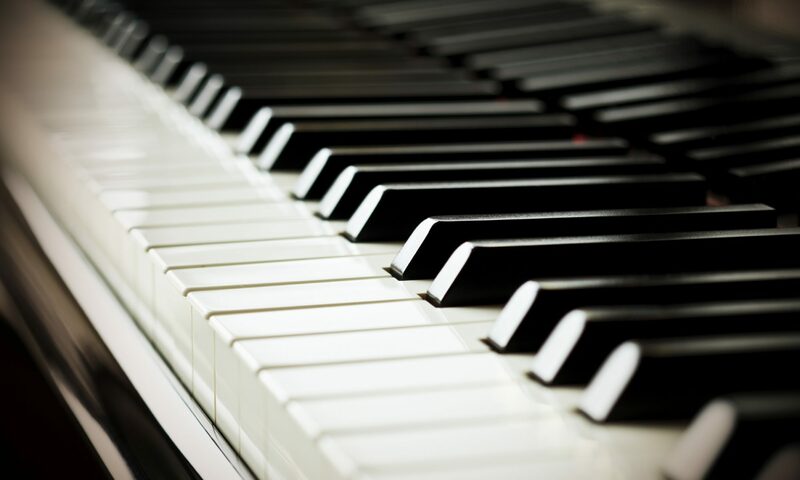 Note: The keys behind the Dominant (G in the key of C) can be played as Major or minor chords, depending on the melody notes or the strength in the chord you are looking for. If they are Major chords they will be much stronger in harmonic structure. If you choose to play them as minors or minor 7ths, the harmonic structure will be much softer and you will basically be harmonizing within the scale or key you are playing. The further you jump back from the key you are in, the more sophisticated the harmonic changes will be within your composition or arrangement. For ex: C – B7 – E7 –A7 D7 G7 back to C. Take a look at the song “Red Roses for a Blue Lady!. You certainly can’t play that song with just C and G7! Lastly, I like to think of the Tonic as being inside my home. When I step outside the front door, it is like going to the dominant chord, and soon it gets cold outside, so I come back into the house. When I go further away from my home, it is like going further back on the Musical Clock, such as to E7 chord. I have to come back to the house (C chord) by way of the A7 –D7 and G7th chords. When I go outside into the back patio, this is like going to the sub-dominant (F chord) I’m still in my home, but not too far from the inside or the C chord. I also think of this when casting my fishing pole out into the ocean, but that is another story! ii – V7 – I Changes: One of the most used chord change is the ii – V7- I progression. In the Key of C, this would be the chords: Dm7 to G7 to C(Major) Please look at the Clock and see how these three chords are positioned next to each other in groups of three, no matter where you start. Dm is the ii chord in C with G being the V chord and C being the I chord. Just start with any key on the clock and call it the ii (played normally as a minor or minor 7th) move clockwise and the next key is the V with the next position being the I chord. It works in all 12 keys. Suspended 4ths: When you are learning Suspended chords, the most used suspension is the 4th resolving to the 3rd. The suspended chord adds “Tension” and tension needs relief! This is a must learn harmony lesson. We also use this chord with the (flatted) 7th tone. This type of chord is found in most Jazz tunes and Jazz improvisation! Think of the Clock as a “SPELL – CHECK” SYSTEM! And the 7th is always the very next tone or progression. So for a C7sus chord, just play C bass, with F and Bb. If you want to resolve the suspended 4th, simply lower that note ½ step (F down to E) This works in ALL the keys. If you are wanting to play like Herbie Hancock, just DON’T resolve the 4th. Here is an exercise for piano or organ: In the right hand, play C-F-Bb-C (octave). Play the C (Root) in the left hand, or pedal (organ). Play all 12 of these Herbie Hancock Jazz chords Around the Clock. Learning basic chords: Here is another way to learn basic MAJOR chords using the Circle of 4ths. Pick any note, add the note one back, then add the note to the right. That is the Suspended 4th . Simply resolve the 4th down ½ step and you will have the Major chord based on the first key you choose. For ex. Play C, add G (note to the left) add F (note to the right or clockwise) “Listen to it, then move the F down to E.
popular and important chord to know, especially in Jazz, pop and Broadway style music. Burt Bacharach, the popular songwriter, uses minor 7ths chords in most of his songs. Look at “What the World Needs Now!” Now look at the clock; Play C, skip the next note and play the next two! Bb and Eb. The foundation for any minor 7th can be spell checked this way. As the four note root position, however, a pro player will NOT play the chord that way most of the time. So use the clock method for learning these wonderful chords! Minor chord substitution: Any minor chord (triad) can be embellished (or substituted) with the 9th chord of the “Next Progression.” (We also use the term “Next Progression” when referring to going around the clock in fourths.) When playing a minor chord, simple play the 9th chord of the next progression instead. For ex. F minor becomes Bb9 – G minor becomes C9. This is mainly used in Major key harmonics rather than songs harmonized in the minor key. A sample progression would be: C – Fm – C, play instead: C – Bb9 –C. Note: The minor chord is actually inside the 9th chord of the next progression. The minor chord notes are the 5th, 7th & 9th of that 9th chord! So, you can see that they are related. This is used a great deal in pop styles. It is important to know how all the eleven (other) chords relate to the key (Tonic) you are playing or composing in. Here is a chart for you to use: I will refer to the key of C as the Tonic for this reference chart. However it goes without saying that this is the same for all 12 keys of the Clock. C to Bb – Bb is a whole tone down from the tonic (C). It is the flatted 7th in the scale (also known as the 7th in commercial harmony) As a chord, the Bb Major, 6th, 7th 9th etc. is a contemporary Dominant. So in the key of C, we substitute the Bb chord for the G chord. This will change the way you arrange songs, especially hymns. C to Eb – The Eb chord is based on the flatted 3rd which is also the note that turns the C Major into C minor. The 5th of C (G) is the common note in Eb (3rd) and can also be substituted for the dominant. Also used in Fanfares, Intros and endings such as C-Eb-D-Db and home to C.
C to Ab – Ab is the flatted 6th and also enharmonic to the Augmented 5th tone of the scale. The C root is common to Ab as the 3rd of the Ab triad. Used also as a whole tone relation to C as well as a substitute for the sub-dominant (F) as well as the dominant (G). There is also a well kept secret about the (actual) note Ab or G#. Do you know the answer? C to Db – Db is ½ step up from C. C is the Major 7th (not flatted) of the Db scale. Used as a penultimate chord in pop music as well as impressionistic period music. Common progression would be: C – F – DbMajor 7th – C.
C to Gb (F#) – Gb (F#) is the flatted 5th an also the sharped 4th of C. Gb shares the “Twin dominant” (3rd and 7th) tones of C which are: Bb and E. When adding a C bass, the chord is a voicing of C7 common in commercial harmony. When the bass note is switched to Gb or F#, it becomes Gb7. That is why our teaching method refers to “only having to learn six 7th chord cores! Get more of this information in my GPS Piano System available at www.sheetmusicplus. Lesson # 7. C to B – B is the Major 7th of the C tonic harmony. It was very strange to find this note added to the C triad (C-E-G-B) until the Impressionistic Era. In the 1920’s the use of the secondary dominants (B7-E7-A7-D7) in relation to C tonic were mainly used. The Major 7th found its way into songs written in 1940 to this day with songs such as: Misty, Ebb Tide, Tenderly, Trombone Samba, and many more. You can even add the 9th tone to the Maj. 7th. Some even add the Maj.7th to minor, diminished, and Augmented triads. C to E – The E chord is based on the 3rd tone of the C triad. The 3rd of E is the Augmented 5th of C. The E Major chord resolves beautifully back to the C chord, using a bass line of E to D then to C. (Whole tone bass line). C to A – A is the 6th tone of the C tonality. In my early days as a church pianist, I would hear pianists adding the 6th to the tonic. This became very bland when I discovered adding the 9th if the melody allowed! This is very common as a decoration of the tonic with harp-like broken chords. A is also added to the C diminished (C-Eb-Gb) triad as enharmonic to the double flatted 7th of C. Hence A= Bbb. The A triad (A-C#-E) or the A7th is the second chord in the “We Want Cantor” pop music progression. It is important to learn the I –VI-II-V progression (C-A-D-G) or with added 7ths (C-A7-D7-G7) in all the keys around the Clock. Again, notice the progression starting with C, bouncing back to A, then progression back to C by way of D to G, then C.
This also works well with minor or minor 7th chord. For ex. C – Am7- Dm7-G7-C. So many pop tunes are based on this progression. Again, learn in all the keys. C to D – D is the 2nd tone of the C scale. The note D can be used as a suspended tone (For ex. C2) taking the place of the root (C) with the intention of resolving it to C. Some contemporary accompaniments do not resolve the 2, but rather keep it in place. A popular tune that uses this suspension is “Thru the Eyes of Love” or the theme song of “The Young and the Restless”. The D Major (D-F#-A) triad can be used as another whole tone progression, especially since the flatted 7th tone of D is C. I love using this progression as the ending of majestic hymns and carols such as “Come Thou Fount of Every Blessing” and O Come All Ye Faithful! The use of the D minor chord will be similar to the sub-dominant or the F chord. It’s time for the Sermon! 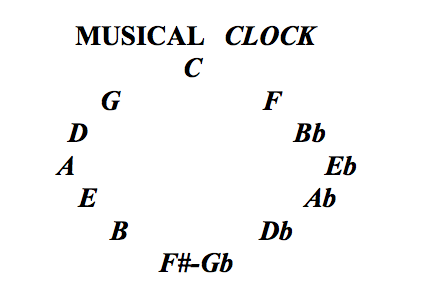 How do I memorize the Musical Clock? I start at the very top of the clock with the 12 O’clock position. I remember that at the top is Christ, with God on the left and Father on the right. Then after the F which is at 1 O’clock, we have the word BEAD with flats. God the Father is at the 6 O’clock position with (again) the word BEAD. And this is an easy way to memorize the Circle of Fourths, know as the Musical Clock! I have even had students buy a regular inexpensive clock and remove the numbers, substituting them for the 12 tones of the chromatic scale. In the 1970’s when I went into the piano and organ retail business, we had two famous music teachers that were hired by the famous Hammond and Conn organ companies to travel around the country, visiting organ dealers and teaching many instructors how to sell organs using a simple teaching method. They were Mildred Alexander and Eveylyn Terrell. Most of the customers were hobby organists, with a few professional organists attending seminars. One of the first items of their teaching program was to show the values of the Musical Clock, using the Circle of Fourths. Some teachers in most cities, resisted since they had already taught the Circle of Fifths. However, after seeing the difference (such as in most of the points in this article) all of the teachers changed. I have a list of over 300 teachers that use this exclusively. By the way, over Five Million Dollars worth of electronic organs, pianos and digital keyboards were sold as a result of their fine teaching. Other famous teachers, such as Dennis Awe, Dyanne Awe, Richard Bradley, LeRoy Davidson, Bill Thomson, used this Clock to teach commercial harmony. I trust that you have been enlightened with this important information above and will join with the many instructors showing our future musicians how they can become composers, arrangers and professional musicians. There are probably more uses for the Clock and I will add them as they become revealed. This article was created and published by Gene Roberson: Composer, Arranger, Organist, Pianist. The material herein may not be reproduced or published in part or in whole without express permission by Gene Roberson. Merry Christmas from the Roberson family! Is Your All On The Altar, sheet music available soon.